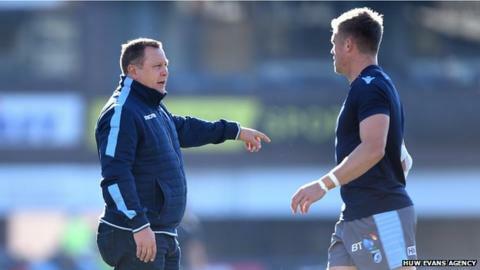 Cardiff Blues "have no reason" to worry about their future despite uncertainty surrounding regional rugby in Wales, says head coach John Mulvihill. The Welsh Rugby Union is discussing possible changes for the 2020-21 season including reducing existing professional sides from four to three and creating a new north Wales region. A merger between the Blues and Ospreys had been on the cards for next season. But that was ruled out by the Ospreys managing director Andrew Millward. Blues boss Mulvihill said all the clubs are in the "same predicament" but there is "an expectation things will be the same" for next season. "It is a focus to make sure we look after what we do," he said. "We have been very transparent with them and fed them information we have had and worked with their managers and agents." Mulvihill also believes the Blues' location and form will help their long-term cause from 2020-21 onwards. "We are the capital city in Wales and at the moment we are probably performing as the best region," he said. "We want to let our rugby do the talking and we will get ourselves in order with hopefully some clarity next week."